Gangs Of Wasseypur opens with two contrasting images. The first shot begins on a television where a woman dances and sings a traditional Indian song. Then the camera pulls off the TV and out into the streets, following an armed militia gunning down everyone in sight in a violent, operatic spectacle. 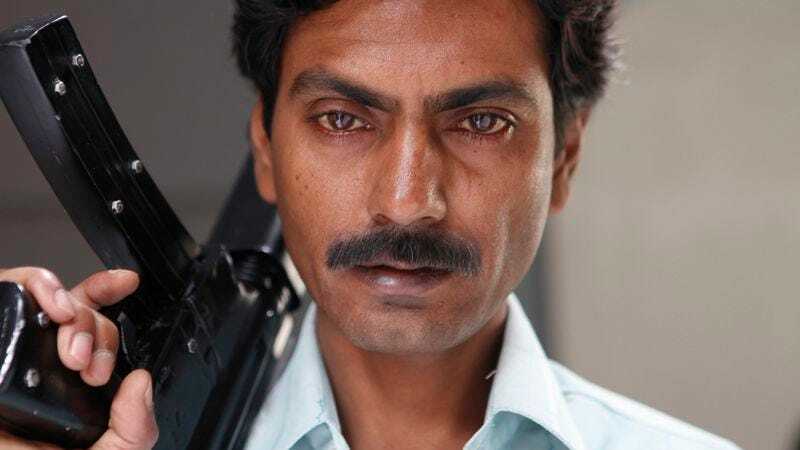 For five more hours, Gangs Of Wasseypur challenges the Western-assumed tropes associated with today’s Bollywood cinema. Anurag Kashyap’s film blurs the line between fantasy and fiction, tracing a 60-year feud between rivals in the Muslim-dominated area of Wasseypur. The plot flashes back to 1941 as two rival gangs, both stealing from British trains, turn violent toward each other, forcing gang leader Shahid Khan (Jaideep Ahlawat) to abandon the Northern region for Dhanbad. Khan works his way up the coal mining business after the 1947 Independence, but his boss, the powerful Ramadhir Singh (Tigmanshu Dhulia), has him murdered after fearing a coup. Kahn’s son, Sardar (Manoj Bajpai), escapes. Thus begins an epic cycle of revenge through guns, politics, marriages, secret allegiances, and total slaughter, with each generation taking up arms against the next. Gangs Of Wasseypur simultaneously indulges and satirizes its violence, recalling less The Godfather than Brian De Palma’s gonzo filmmaking. The stylish gangsters might emerge onscreen bouncing to rap music in slow motion, but they accidentally backfire their guns, misplace stolen drugs, and fall for obvious traps due to their outsize egos. The women, though unable to stop the continued bloodshed, constantly scoff at their husbands’ violent indulgences. To them, they are less dangerous than comic buffoons. “Every fucker’s got his own movie playing inside his head,” one character remarks, and Kashyap embraces this idea through what could be a collective subconscious in its hyper-stylizing. He spares no aesthetic expense, opting for an overexposed color palette, action sequences cut in rapid fire Hong Kong style, and a booming soundtrack that makes each gunshot sound like a bomb. The film ends with a character pumping hundreds of bullets into a body as pink movie blood sprays out like a hose; the thirst for revenge has become completely divorced from reality. Of course, Bollywood has rarely stuck to realism. Gangs Of Wasseypur just adds an over-the-top, overlong, masculine macho epic to sit alongside the musicals. Availability: Gangs Of Wasseypur is available on Blu-ray from Netflix or possibly your local video store/library. It’s also available to rent or purchase digitally through Amazon.